This Porchetta Roast recipe is an easy smoked version of the classic rolled Italian roast pork. 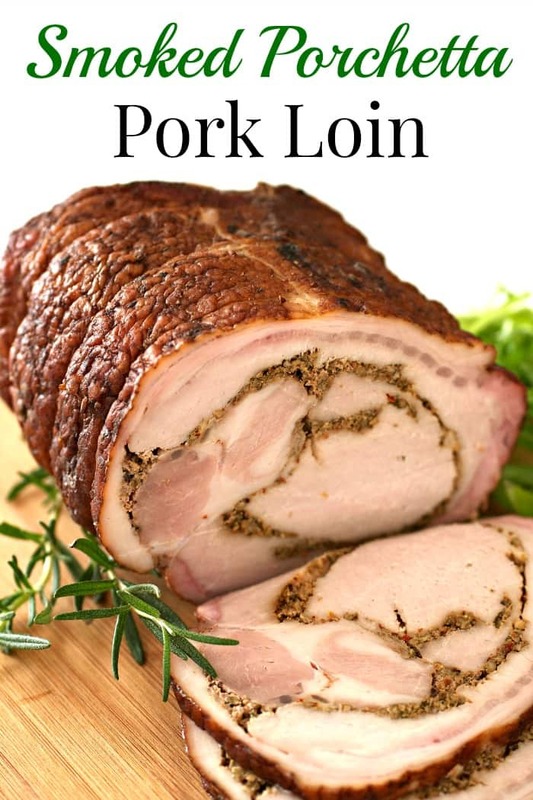 Made with an inexpensive pork loin and filled with all the traditional flavors of fresh herbs, fennel, and lemon. Summer is right around the corner so you know what that means…BBQing!!! 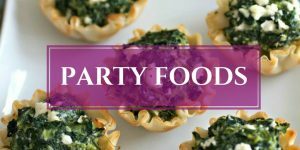 I’ve teamed up with a bunch of my fellow bloggers for the Great Blogger Barbecue to bring you 50 fantastic recipes that are perfect for summer. Check out all the recipes below after my post and get yo grill on! The weather is finally starting to clear up in New Hampshire with the cold rainy days disappearing and the sunny skies opening up. The first chance at a perfectly sunny day to smoke, J and I went a little overboard and did a smorgasbord of meats, including a whole chicken, a whole jerked pork shoulder, lamb ribs, pork ribs, and this tasty smoked porchetta pork loin. Usually when making porchetta at home, I use skin-on pork belly on the outside of the pork loin and roast it in the oven. The result is a wonderfully crispy, crunchy skin that a traditional Italian porchetta is known for, but I couldn’t find a big enough pork belly at any of the local farms so I had to improvise using a pork lion roast with a beautiful fat cap on top. 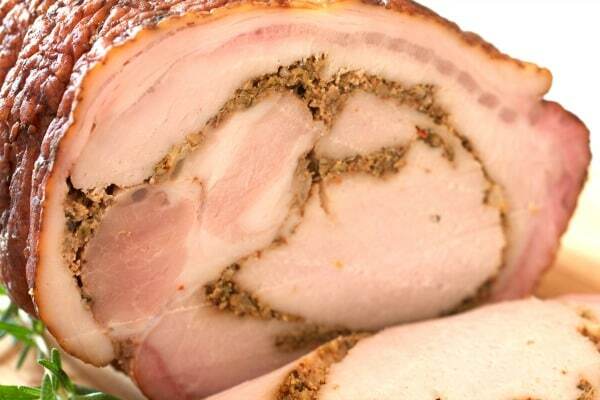 The history of porchetta originated in Central Italy, where a whole pig is deboned, filled on the inside with a stuffing made of it’s own chopped up offal (organ meats), fresh herbs, and spices. It’s then rolled up and cooked it in an underground pit. 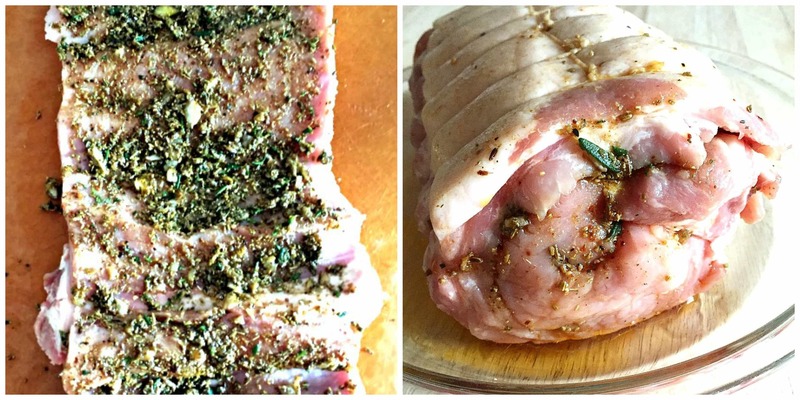 Today’s interpretation of porchetta uses a boneless pork loin with the attached skin-on pork belly and stuffing the inside with lots of fresh herbs, lemon rind, dried fennel seeds, and other seasonings. Also, instead of digging a large hole in the backyard, the pork is just roasted in the oven. Not as much fun as they had in ancient Italian times, but it’s just as good. 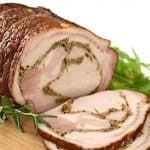 This smoked porchetta recipe is a pretty healthy alternative to the original, since it’s made with a leaner pork loin and doesn’t have all that fat associated with a pork belly rolled around it. 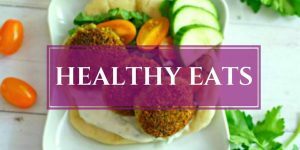 It’s made with fresh, all-natural ingredients and there’s no flour or sugar added so it’s definitely classified as clean eating. Leftover also make THE BEST porchetta sandwich in the world!!! Just thinly slice up the meat and put inside a fresh, crusty roll. No lettuce, no tomatoes, no condiments, just meat and bread. 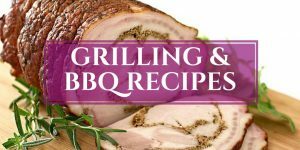 Don’t forget to check over all the summer lovin’ recipes from the Great Blogger Barbecue below and hope you all enjoy this Smoked Porchetta Roast Pork Loin recipe too! Happy grilling! 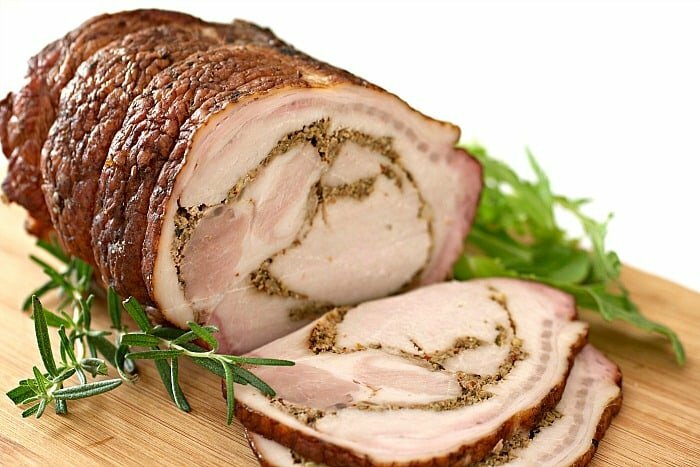 This Porchetta Roast recipe is an easy smoked version of the classic Italian rolled roast. Made with an inexpensive pork loin and filled with all the traditional flavors of fresh herbs, fennel, and lemon. Place pork loin on a cutting board. Using a sharp knife, insert a knife into the lower portion of the loin, about a 3/4 inch from the cutting board. Slowly cut into the loin in a spiral motion maintaining the 3/4 inch thickness until the center is reached and the loin can be spread out flat. Smoke the porchetta pork loin at 225F/107C degrees for approximately 3-4 hours, or until internal temperature registers 145F/63C to 150F/66C degrees. Leftovers may be stored in a covered container in the refrigerator for up to 4 days. Fry leftover pork slices in a skillet for a delish breakfast or lunch! Yes, smoked meat IS always better, Karrie! How delicious does this look?! It’s only early in the morning and totally craving this right now. And, it’s never too early ’cause have with an egg and call it breakfast, right? Pinning, of course! Wow. just wow. Smoked. That’s pure deliciousness! Brilliant! No stop it! Just excuse me while I drool on my keyboard for a little while!! Wow, Karrie, Rome and surrounding area is the porchetta “realm” and they would be proud of the smoked porchetta pork loin you made! It looks fantastic, lean, so flavorful with the herbs and perfect for summer grilling! Great job, my friend! So happy we’re both part of this Great blogger BBQ party! What a looker! This would make a seriously stunning dish at any BBQ – know my hubby especially would be drooling over it! And you know I love that it’s a healthier version Cheers to summer and the warmer weather! Now that’s a centerpiece if I’ve ever seen one! Gorgeous and oh so delicious!!! I would love this for dinner, winter, spring, summer, and fall!!!! Whoa! You guys sound like us when we have one of our meat fests! We throw all kinds of meat in the smoker and feast! I’m loving this stuffed pork! Your herb paste sounds like a way more appetizing stuffing than organs to me! You had me at Smoked but Porchetta just sent this over the top Karrie! I can`t wait to make this! Thanks for the AMAZING post & so stoked for your 50 Summer Cookout Recipes! I already have Katie`s Quinoa Tabouli by A Fork’s Tale & Kathryn`s Cheddar, Corn and Bacon Potato Salad by Family Food on the Table programmed to make for a BBQ this weekend! Looks incredible! I would try your recipe, I am sure my husband would love it. 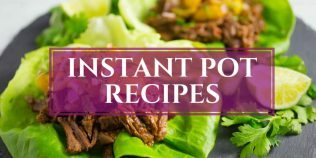 And that 50 summer recipes – what a great collection. Weather is finally getting warmer here too. Love how incredibly delish this pork looks. Also love all the flavors of fresh herbs, fennel, and lemon. Sounds so good. 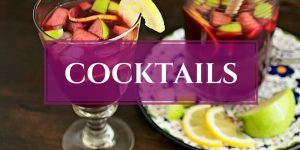 This is such a fun and awesome collection of 50 summer recipes. Oh my! This smoked pork looks fantastic. And you know what? Even though pork isn’t my favorite meat, I would try (crossed out) gobble up this one. With all these herbs, that has to be a wonderful combo! Well done, Karrie! Oh my goodness! I’ve never made a stuffed pork loin before but I think I need to! Oh don’t get my husband started on smoking! We had a smoker back in DC and we ditched it before we moved (it was falling apart anyway). Now I frequently hear…. ‘aww, I wish we had a smoker’. 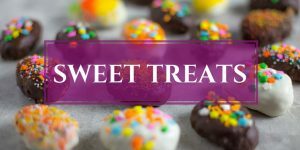 Looking at this recipe – I think we need to get another one! Wow! This looks amazing! We’ve roasted a whole pig before, but it was on a huge smoker, not buried in the ground. I like this modern version. Cooking in the oven makes much more sense plus a whole pig is a ton of food! I am not a pork eater but this looks like something i should try once. I absolutely love it. I’ve never had porchetta, but holy moly does that look amazing! As I was reading your post and looking at the photos, I just couldn’t help think “wow, Karrie is such an awesome cook!” Your hubby is so lucky! This looks so good, what a great recipe for summer! Karrie, your Smoked Porchetta Pork Lion looks impressively beautiful. I don’t have much of a yard to dig a big hole for a barbecue, so glad you can cook this on a smoker. I finally made your preserved lemons. I am impatiently waiting for the 3 week mark…. and when it comes, do you know what I am making next? I am making your Preserved Lemon Martini!! 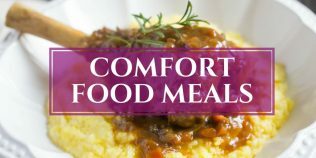 Thanks for all the great recipes!!! Probably because you wrapped it in BACON!!! Hahaha! Seriously, thanks for making it and taking the time to comment. Hope you had leftover smoked porchetta the next day for breakfast and sandwiches!